Poster art indicates its not a musical. 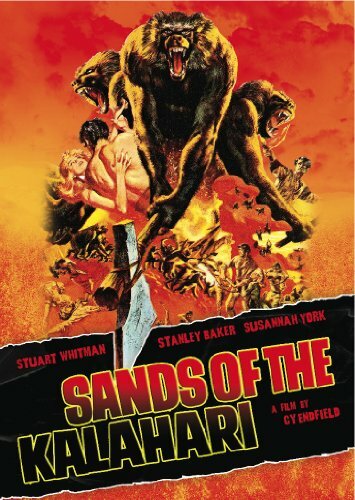 Sands Of The Kalahari has developed a bit of a cult following in the years since its 1965 debut, when it was a surprising failure at the box office. A small plane plows into a swarm of locusts and crashes in remote Namibia. How will the five men and one woman (oops–trouble, double oops–she’s beautiful) survive the unforgiving environment? Not in ways you think, as the story cleverly confounds cliches and gets these people to surprise each other and the viewer. Bizarre, with stunning locations in the blazing desert (some shot way down in remote and striking Namibia, some in Almeria, Spain dutifully doubling for Africa), bearing an offbeat score from Johnny Dankforth and tight direction from Cy Endfield. Endfield and co-star Stanley Baker helped produce as well (overseen by Joseph E.Levine), hoping to re-ignite the success they’d enjoyed with Zulu. Beefcake With Rifle Situation, desert version. Joining Baker in the heat are Stuart Whitman (in bared-chest macho overdrive), Susannah York (baring as much as censors allowed), Harry Andrews (dependable),Theodore Bikel (kindly), and Nigel Davenport (rotten swine). Ah, one more little thing…a large tribe of fearsome baboons, equipped with fangs formidable enough to secure high ranking on the “I Told You Not To Pet Them, You Idiot” List. Some of the behaviors (especially York’s) suit plot convenience more than logic, but the cast is good, the setting wild and the dilemmas are compelling. Even if you question whether the camera-time spent ogling the lovely York matches that devoted to the he’est-man Whitman, you’ll have to safari a long way to find a finale as one-of-a-kind whacked-out unsettling as this delivers. A minute shy two hours of nifty adventure. Another crash-in-Africa-cross-fingers saga that same year, The Flight Of The Phoenix, also failed to attract audiences, and critics of the time sneered at both. The Naked Prey (no plane, no friends, no dame, no clothes even) fared somewhat better. Today, all three are well regarded, having outlasted the fickle nature of popcorn patrons and the bared canines hierarchy of supposed screen sages. Bring on those baboons!